It takes an exercise of this nature – an exhibition of sculptural pieces, each of which represents a significant design movement – to make startlingly visible to the visitor just how central has been the role of the designer in the construction of the material, cultural and social fabric of the world we inhabit today. It serves to highlight to the design students themselves that they belong to an influential continuum and that, historically, their contributions very much mattered; and, more importantly, that they should continue to matter. At key moments in history it has been the voices and actions of past designers who’ve taken the polemical, intellectual and creative lead in proposing new solutions to economic, cultural, political and societal ills. From the Arts & Crafts movement and its concern for the preservation of artisanal skill in the face of the advance of the subjugating machine and mass production – through to Gropius’s founding of the Bauhaus as part of a wider mission to improve the condition of humanity in response to his direct experiences of the horrors of the First World War – the voice and delivery mechanism for change has been design itself. Under different circumstances, and at a time when the USA was in the grips of the Great Depression, it was the impact of emergent celebrity designers such as Loewy, Bel Geddes, Teague and Dreyfuss and their capacity to transform mundane domestic goods into futuristic streamlined wonders that launched the economic recovery. Streamlining was the most notable face of a design movement that triggered a massive consumer and corporate spending spree. Perhaps more profoundly, these designers also discovered and perfected the design recipe that would sustain ongoing consumption via the mechanism of inbuilt obsolescence. And after WWII when modernist architects looked to build the world anew with clean forms that celebrated space and light over dinginess and darkness, volume over mass, geometry over tacky ornamentation, and standardised (and theoretically cheap) production techniques over the bespoke and the vernacular – the international style was born. In their imaginative piece, “Purism”, which features a white interlocked structure connected by primary-coloured ties, creators Carwyn Hong-Eveleigh, Dom Wheeler, Jae Hoon Ahn and Joe Fraser explore the earlier purist phase of the international style theme in a contemporary context that successfully moves their outcome beyond mere pastiche. That the modernist utopian dream should subsequently find itself so disastrously diluted in execution by those charged with implementing a cheapened version of it ought to be salutary. The sub-standard social housing horrors of the post-WWII reconstructive effort is stark testimony to how the designer’s vision can be so catastrophically mutilated in the compromising processes of transformation into concrete reality. This dystopian perspective is picked up and explored by some students in the works on show. 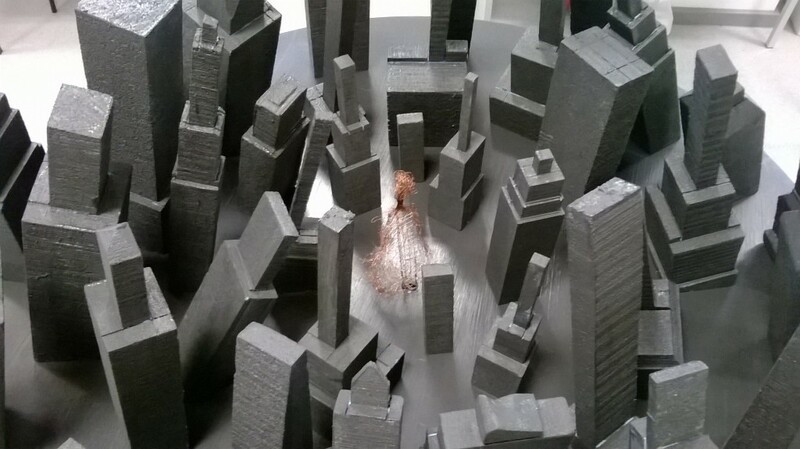 In a piece inspired by the industrial revolution from a group comprising Anthony Dunn, Adam MacKerron, Jeevan Coolican and Ana Maria Pava, an abstracted figure of a woman is menacingly encircled by inwardly angled, grey monolithic tower blocks and brutalist skyscrapers (pictured above). If Corbusier’s aphorism asserted that a house is a machine for living in, then the creators here have looked to evoke a sense of the oppressive and despair-inducing qualities that they say characterise the built environment as machine in cities such as Birmingham and Manchester. More cheerfully, “The Birth of the Auto Design Studio”, from Thomas Smith, Elliot Brett, Jamie Thresher and George Slater beautifully serves up a microcosm on the apogee of the streamliners art as applied to car design in ‘50’s America. As cars, these magical winged and finned creations were capable of nothing less than space flight (or so it must have seemed) and celebrate a time of overt optimism in which all things seemed possible and design aesthetics simply reflected that mood. Elsewhere, an exuberantly executed sculpture from Yuexian Li, Ying Zhong, Vimal Natu and Mahesh Nagarkar, takes the form of a cube featuring a maquette of a famous Pop-Art motif on each face – all in eye-fizzing, bold, comic-book colours; it brilliantly captures the sheer fun and excess of the era. Across all the works on show there is a strong sense here that by having to actually produce an artefact that successfully represents their topic of choice (rather than having to simply report on it), the students have genuinely grasped the significance of their research activities. Quite possibly, they have come to understand that the process of design was – and still is – very much about thinking in its widest context and striving to make a real and material difference to people’s lives.